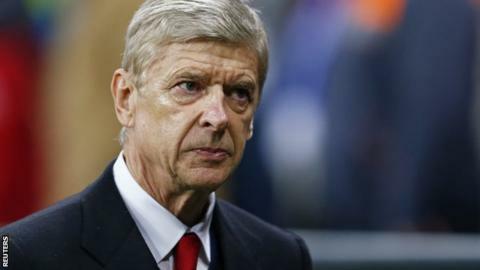 Arsenal manager Arsene Wenger says football "has responded the way you want it to" after the attacks in Paris. "The football world has a big union and togetherness," said the Frenchman. "You always think after this kind of event - do you continue to play or do you stop your life?" Belgium's friendly with Spain on Tuesday and Germany's match against Netherlands were subsequently called off. Wenger said the decision to play Tuesday's game at Wembley was right and thanked "the English community" for their show of solidarity. He said: "It was fantastic for France and it showed the class of England to see the arch of Wembley in French colours. "Now we must get on with life and respond to the situation in a positive way. You can't stop everything. You have to focus on something else." Arsenal visit West Brom on Saturday (15:00 GMT), and Wenger said he will check that France international Laurent Koscielny is in the right frame of mind to play. "You could see he was not himself on Tuesday," said Wenger. "It has affected him deeply. He wasn't the same player. "I will talk with him to see if he is completely recovered and focused. It is a big game for us. If he is not completely committed or feels ready I will not play him." Newspaper reports on Thursday suggested Arsenal were set to offer forward Alexis Sanchez, 26, and record signing Mesut Ozil, 27, new contracts. Sanchez and Ozil are both under contract until 2018, and Wenger believes the club are in no rush to tie them down for longer. "We have some time. We are not in a hurry," he said. "We want them to stay."